With the insurance industry evolving at a fast pace, underwriters are compelled to increase profitability through accurate and consistent underwriting decisions while decreasing response times, errors, and costs associated with claims. To assist underwriting industry thrive amidst competition, a plethora of technology experts have laid the groundwork—leveraging IoT, automated data classification, and blockchain technologies in pursuit of improved customer experience and quick turnaround, and are gradually gaining mainstream attraction. With big data, predictive and risk analysis, and artificial intelligence beginning to scrape the surface, the solution providers are bombarding the market with numerous software and applications, allowing underwriters to independently perform discovery and analysis from multiple disparate data sources in real time. Targeting both, the quality and efficiency of risk assessment and underwriting decisions, these solution providers are ensuring the business is on the right side of the analytics revolution for best underwriting outcomes, combining data driven analytics with human judgment. In order to help insurance companies choose the underwriting solution, a distinguished panel comprising of CFOs, CIOs, analysts and the Insurance CIO Outlook editorial board, has reviewed companies with a proven record of expertise in assisting enterprises with cloud-based underwriting solutions combining predictive analytics with human judgment. 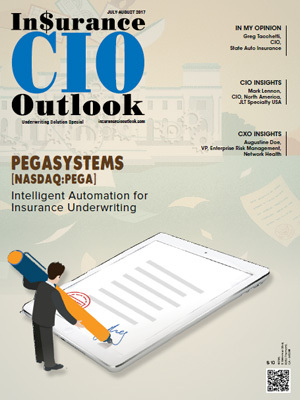 The companies featured in this issue have exhibited extensive underwriting knowledge combined with cloud strategies. We have considered the vendor’s ability in building solutions and services that can effectively yet economically account for a productive underwriting, keeping in mind the factor of time-focused delivery. We present to you Insurance CIO Outlook’s Top 10 Underwriting Solution Providers 2017.